We fitted in a lot of decisions and a lot of discussion. Â Please note the many dates for your diary. To run a stall at Forest Gate Festival onÂ 21 JuneÂ and ensure one way or another that there was also a Dr Bike. Also to explore the possibility of a bike marking session from the Met Police.Â Â Let me know if you could do a stint on the tall for however long or short a period. To man a stall at the Forest Gate flea market onÂ 18 MayÂ (subject to confirmation that we can). Â This could be used for the Space for Cycling Campaign which will still be current. Â Again if you could do a stint let me know. To run a feeder ride with Tower Hamlets to the LCC central London ride onÂ 17 MayÂ co-ordinating also with Redbridge. Â There will be a met in forest Gate and a fixed pick up at a suitable point in Stratford. Â We will go through the Olympic Park and by canal to the Green Bridge to meet Tower Hamlets Wheelers. Â Again let me know if you would like to assist (essentially backmarking the group). 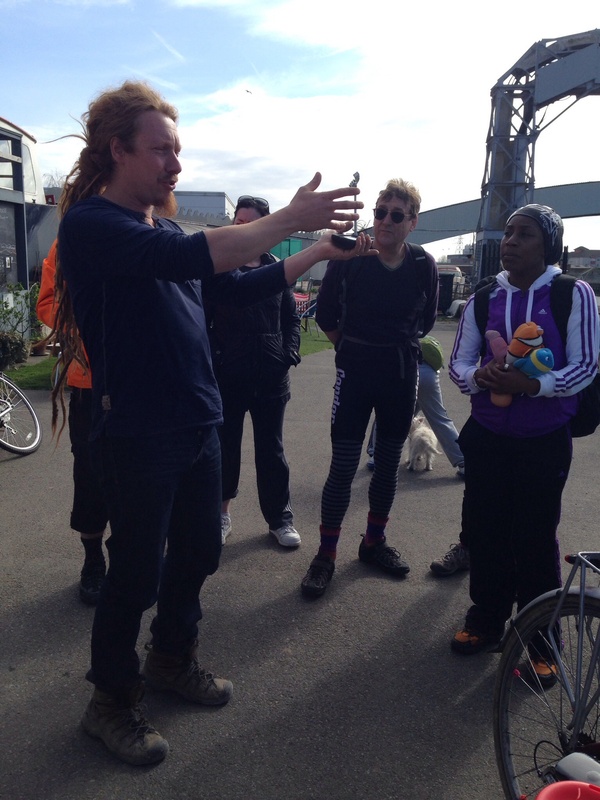 Our fourth Newham Ride will be onÂ 7 SeptemberÂ (subject to being able to access Cody Dock). To print business type cards to distribute with our contact details. Â Bill’s mock up met with universal delight. To update our general leaflet and get it professionally printed. To add Â British Cycling rides in and around the Olympic Park and the Lea Valley to our events calendar. To design and purchase a pop up banner. To explore the possibilities for publicity in the margins of the Tour de France onÂ 7 July. To publicise convenient group rides -Â 20 JulyÂ to Southend andÂ 27 JulyÂ to Cambridge. To convert our next meeting into an evening ride around the Olympic Park ending up at the Â Brewery Tap cafe in Forest Gate. 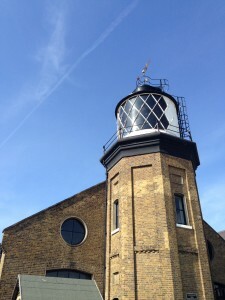 Â Due to Bank Holiday (when there will not be our usual Monday meeting) this will take place onÂ Tuesday 3 JuneÂ starting at Forest Gate market site (corner of Sebert and Woodgrange Roads) at 7.00pm aiming to get back to the cafe at 8.30pm. Â Please note that this is a change of date from that discussed at the meeting due to availability of the cafe. Â As it will be opening specially for us can youÂ please let me know if you are wishing to come along, so we have an idea of numbers. As if all that was not enough we also managed to fit discussion on the reaction from local candidates to the space for Cycling Campaign (poor, despite our efforts which were selected for special plaudits by the LCC) and an in depth discussion of cycle provisions and culture in the light of the recent presentation at the Dutch embassy. Thanks to everyone for their contributions to a lively meeting. An interesting and lively meeting. Â On the formal side we approved an annual report and accounts. Arnold Ridout Â and Kerena Fussell were elected as joint co-ordinatorsand Bill Bremner re-appointed as Treasurer. Richard outlined the positive future for potentiallyÂ transformative cycle provision, funded from a variety of sources) despite the fact that Newham had not achieved mini-Holland status. Â Still very much on the radar are: Â quietways (Stratford to Ilford, Stratford to East ham, improvements to the Greenway, improvement to the Greenway. Â A new “Roding Way” along the line of the A 406 was being considered; the extension of CS2 to Ilford remained in the lap of TfL; removal of the Stratford gyratory is now on the TfL junctions improvement programme. Olawale reported on progress on theÂ ward audit.Â Â The intensive series of rides had taken place which has identified over 500 schemes for minor works to improve permeability. Â Cycle contraflows in quiet one way streets dominate, but also there were some significant link-path creation and improvement possibilities. Â There would shortly be a consultation on prioritisation for the Â£100,000 per year funding available over the next three years. Â We will try to make photos available. We have completed our ward asks for the LCC’sÂ Space for CyclingÂ campaign and everyone was encouraged to use the LCC website to lobby local councillors. Â This should raise the profile of cycling. Â We considered favourably a feeder ride to the “Big Ride” in central London on 17 May. Â An idea for events was to have stalls in markets with Dr Bike. 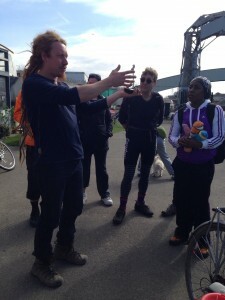 The first Newham Ride was considered a successful start toÂ our rides season. Â We need to ensure photos are available for future publicity by obtaining consents of even doing a special photo shoot. Â We will fix a late summer autumn version and advertise British Cycling Olympic Park/Lea Valley rides. 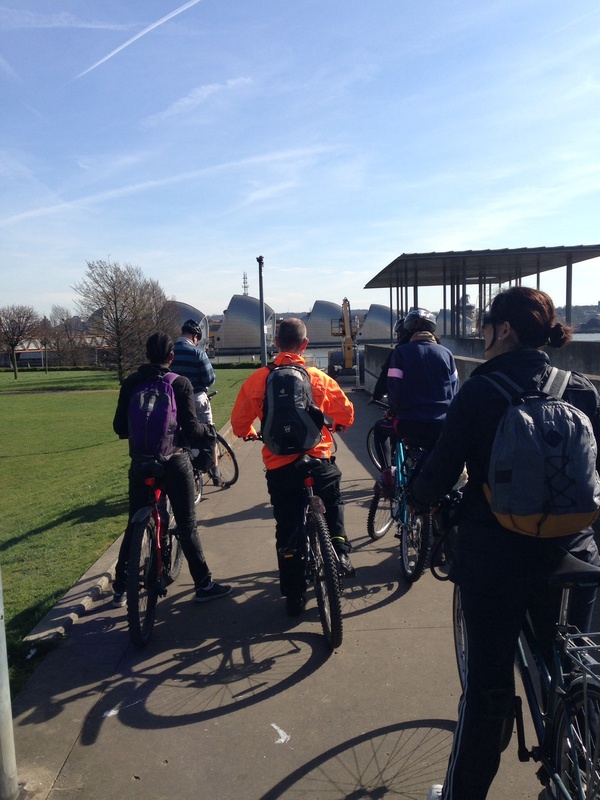 Â Additionally we will continue with some weekend rides in conjunction with Tower Hamlets and Hackney. Â Our summer meetings will be short evening rides/picnics. We decided to consider further whether to support theÂ Stop Silvertown TunnelÂ campaign. Karena outlined progress onÂ communications. Â We will seek to progress further with Twitter feeds, and produce small publicity cards/leaflets which can be left at strategic spots such as the View Tube. 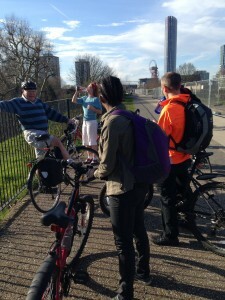 The ride season got off to a good start with over 15 joining in the first Newham Ride. Â Fortunately the weather was excellent and there was improved access to the Olympic Park. 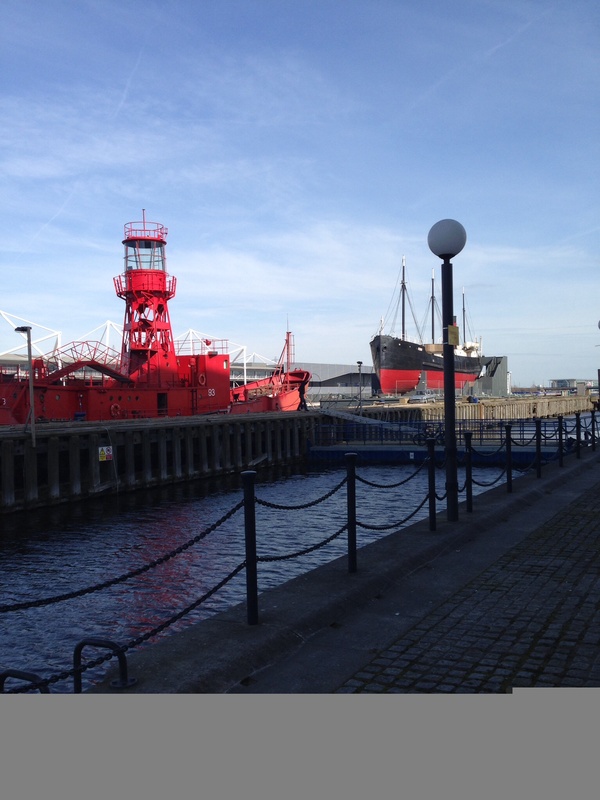 Â Having taken a look at the northern section of the Olympic park we moved down the river Lea to Cody Dock where Simon, who runs it, outlined his successes to date in carving out a new riverside community facility and his exciting plans for the future. We moved down to the River Thames for a lunch break at Trinity Buoy Wharf. Then through the Royal Docks to Â Thames Barrier Park, with its riverside pavilion and view of the Thames Barrier. We then wended our way back via Beckton and the Geeway to the View Tube for a wellÂ deserved piece of cake and cup of tea. Â For the majority of the riders there were significant new discoveries and for all of us a pleasant reminder of our interesting borough. This is a news update to sight everyone on what is current, before the annual meeting on 31 March. Sadly Newham’s mini-Holland bidÂ was unsuccessful, but there are positives to come out of the exercise, and Councillor Christie has been in touch to outline these. Â In fact there remains a good chance Newham may get most of what it bid for (albeit through different pots of money). Â For example Stratford gyratory has been listed amongst the junctions for improvement, TfL has committed support for the Leaway (Cody Dock to Canning Town) Â and there is likely to be support for the Greenway improvement and linked quietways. CS2 to Ilford may come from the CS programme. Disappointingly our request forÂ Upper StÂ to have a 20mph limit was overruled. on the following grounds: Â “Being a bus route and major road link in the borough it was agreed that it was not appropriate to install speed reducing features on Upper Road to bring the speed limit down to 20mph, and that the objection be overruled” Â It is particularly retrograde to treat Upper St as a major through road, which it should be not and does not have to be; and then to use that as an excuse to allow motor vehicles to use it at a dangerous speed. Â Cyclists and pedestrians have to pay for the police and the Council’s unwillingness to enforce traffic rules. I have been given a design forÂ Carpenter’s RdÂ for when it is opened as a through route. Â This is a key Olympic Park connection route. Â A 20 mph limit is proposed (it is a bus route and a through route which makes Upper St even less understandable). Â It looks like cyclists are being pushed back onto the carriageway from shared paths in the railway tunnel. Â I have sought further clarification. The Council have adoptedÂ Honour Lea Avenue. Â This is the key east west cycle route through the Olympic Park for which LLDC left its miserly and minimal cycle facilities – in particular a two way cycle track on only one side of the road. Â Fortunately the Council in this instance recognises that the cycling provision should be better (indeed throughout the Olympic Park and Westfield areas). Â So still lots to play for here. On the bright side, Â the crossing over this River Lea on this route (near the Copper Box) has been left as stairs and a lift. Â This was a matter of constant objection from LCC and it now looks like something better is going to happen. Sandringham Rd and Cramner RdÂ cycle contraflows, as request by us, Â are now going to be put in place (albeit later than the one introduction of the one-way schemes). TheÂ “No to Sivertown Tunnel”Â have campaign have written to seek support, financial or otherwise. 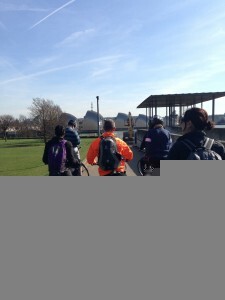 The first of this year’sÂ Newham RidesÂ had a good turnout this Saturday and excellent weather. This will take place at 7.00pm at CoffeE7. Â See events page for details. This is a news update since our last meeting. Our representations for cycle contraflow for Cramner and Sandringham Rds one way schemes have been agreed in principle and have been fed into the system. Â This element of the scheme will need to be republished and re-consulted, which will take some time. Ward by ward audits are progressing. Â Most of the north of the borough has been covered and priority minor schemes for increased permeability have been identified. The work done may be consolidated in a daylong workshop to prioritise the use of the available funding, the exact amount of which should become clear after the mini-Holland outcome is known. The Mini-Holland outcome should be known by mid-March. Â Fingers still crossed. Our annual meeting will take place onÂ 31 March 2014 at CoffeE7. Â It will be mostly a social/celebration. Â Light catering will be provided. Â Councillor Christie, who has done so much to progress cycling in the Borough, has been invited. Â On the formal side we have to elect officers. Â For the last few years we have not filled all the posts so volunteers/nominations are very welcome. Â To me at any time before the meeting. The (almost) one million pounds awarded to Newham by TfL to promote the mayor’s vision for cycling will be used primarily for cycle parking and cycle training, and also to develop a Borough cycle strategy. I have received a consultation on the extension of the Stratford NE controlled Parking Zone. Â I could identify no particular cycling issues, but if anyone would like to see it please let me know. I have also received a consultation to add Helena Rd Plaistow to the 20mph region around Plaistow. Â We have commented on this to urge the inclusion of Upper St. Â It is also re-enacting most of the one way systems in the area. Â In line with our policy of pressing for cycle contraflows I suggest responding that in re-enacting the one ways provision should be made for cycle contraflows. Â Comments welcome. Finally, don’t forget the Newham Ride onÂ 15 MarchÂ starting 10.00am at the ViewTube. CS2: Â the LCC post implementation audit of the section completed, which covers the criticisms raised at the January meeting is in the hands of both TfL Â and Newham council. Â still no news on when the Staratford Broadway section is likely to be completed. Â In response to a request from Action and Rights of disabled People in Newham the consensus of the meeting was that there was no significant problem, so far, at the island bus stops. Â There was no objection to giving priority to pedestrians at the raised tables but, onÂ theÂ otherÂ hand, there may be an advantage in not having priorities by analogy with the idea of shared space found, notably, at Exhibition Rd. This new website was greeted with an acclamation of approval. Â Thanks were given to Rob for getting this up an running. The ward audit with Newham Council is due to continue this week and the team of volunteers has expanded. We were given an outline of the plans for improving the Greenway and permeability in the area around the Hospital, New City, Brampton etc. schools including more ramps on the Greenway, permeability in the areas and a north south quiet route from Boundary Lane to the Romford Rd. Â This would meet a number of our long standing requests. Our next meeting on 31 March at CoffeE7 will be our annual meeting. Â It will be a social occasion and celebration of the progress over the year. Â Light catering will be provided. Â Watch this space. Stratford and New Town. Â “Support the mini-Holland Proposal to remove Stratford Gyratory and complement it by facilitating safe cycling in Warton Rd, Carpenters Rd and Cam Rd – the Broadway.” Â Themes- Liveable Town Centres and Â Protected Space for Cycling. Â Warton Rd and Carpenters Rd need protected cycle routes. Â The Cam Rd access to the important Channelsea Path would be facilitated by two way working on CS2 for which there is room if the redundant barriers were removed. Manor Park.Â Â “Completion of CS2 from Stratford to Ilford according to good continental standards” Â Theme- Protected Space for Cycling. Â “The completion of CS2 will provide a safe route on a major route linking densely populated areas to a string of town centres and assist cycle commuters. All bus and cycle lanes included in the design should be operational 24 hours. Little Ilford and Wall End.Â “Establish a “Lower Roding Way” using opportunities to create a continuous cycle and pedestrian path on the Newham side of the A406″ Â Theme- Greenways. Â There is the opportunity to create a greenway through Little IlfordÂ Park, Barrington Playing Fields and Langdon School linking CS3 to the Romford Road and the Roding Way. Â It would also involve improving or bypassing the A406 junction with Barking Rd. Â It would link to other Greenways and quietways in and connected to the Newham; and ease the difficulty in cycling north-south and open up a useful connection to the Riverside Opportunity Area. East Ham South. Â “Improve the crossing of the A13 at the Greenway to make it more cycle and pedestrian friendly.” Â Theme – Greenways. Â This junction has cycle provision through a series of toucan lights but they are extremely and unnecessarily adverse. This would improve the linkage to the southern section of the Greenway and also complement the Beckton ward ask. Beckton.Â Â “Improve the Asda roundabout and restore the cycle/and bus lane between there and the A13.” Â Theme -Â Protected Space for Cycling. Â The Asda roundabout is cycle unfriendly roundabout made worse by the difficulty crossing traffic leaving Asda. Â ThisÂ needs redesigning and the major desire route to the A13 (and CS3 and the Greenway) northbound along Woolwich Manor Way needs protection which could be given by a Â cycle track or a 24 hour bus/cycle lane (effectively restoring the bus lane that has been removed). Canning Town North.Â “Completion of the Lea Valley Path from Three Mills to the Thames in accordance with the mini-Holland proposals.” Theme -Â Greenways. Â The planning for this work has been inherited from the Thames Gateway Development Corporation and would create a major leisure route and a route linking Canning Town to Stratford. Plaistow South, Plaistow North and Green St West. Â “Complete a quietway from the A13 via Brampton Manor Schools and New City Rd to the Romford Rd” Theme – Â Safer Routes to Schools. Â This route can be carved from existing off road and quiet routes and would link numerous schools and the hospital. East Ham Central. Â “Permit cycling both ways on the restricted section of High Street North and improve the junction with Barking Road. Â Theme- Liveable Town Centres. Â “This is the natural route for cyclists wishing to visit East Ham Town Centre. “Promote cycle safety for children by making a general 20mph speed limit and promote an “every child a cyclist” scheme. Â Theme – 20mph. Â Newham is ideally suited for 20mph (except for the A12 and A13) as it is mostly narrow residential roads or new development that should be designed with residents in mind. Â The present complexity of variable speed limits and the existing anachronisms encourage speeding. Â A borough wide 20 mph limit would promote Newham as a place to live rather than a place to drive through, and facilitate enforcement and decluttering. An Â enforced 20mph speed limit would be an excellent environment in which to train young people to develop the safe cycling habit. In order to complete our “ward asks” for the LCC Space for Cycling Campaign by the end of the month we are bringing forward our monthly meeting to 10 February. Â This will be the main item on the agenda, but Â we can also pick up on Â developments from last month’s busy meeting. Â We will meet in our usual venue CoffeE7 in Forest Gate at 7.00pm.